LHASA, Tibet -- Southwest China's Tibet Autonomous Region has launched a two-year project to study and preserve a bundle of Buddhist scriptures that were written on leaves more than 1,000 years ago and brought to the region from India. There are some 4,300 'pages' of the rare tree-leaf Buddhist Sanskrit scripture in 426 volumes, said Hu Chunhua, a top official of the autonomous Region, quoting figures provided by the local cultural heritage administration. The scriptures are inscribed on stripes of leaves of the pattra tree which is native to tropical climates and similar to a palm tree. The tree's leaves, which are easily transportable and durable, were used before there was wide access to paper. A steel pen was used to etch the Sanskrit directly on to the leaves, which themselves became a Buddhist symbol of brightness as the scriptures brought enlightenment. 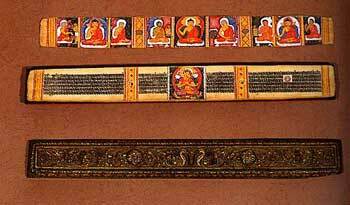 Hu said Tibetan researchers will carry out a thorough survey of all the scriptures written on pattra tree leaves. "It's important to train more Sanskrit professionals in order to preserve the ancient documents," said Lhagba Puncog, secretary-general of China Tibetology Research Center. The preservation project is jointly sponsored by the Chinese Academy of Social Sciences and the China Tibetology Research Center.